Born in New York, Arthur Greene studied at Juilliard with Martin Canin, and received a bachelor’s degree from Yale University and a doctorate from Stony Brook. Greene was a Gold Medal winner in the William Kapell and Gina Bachauer International Piano Competitions, and a top laureate at the Busoni International Competition. He performed the complete solo piano works of Johannes Brahms in a series of six programs in Boston and recorded the Complete Etudes of Alexander Scriabin for Supraphon. Greene has performed the 10 Sonata Cycle of Alexander Scriabin in many important international venues, including multi-media presentations with Symbolist artworks. He has made many recordings together with his wife, the violinist Solomia Soroka, for Naxos and Toccata Classics, including the Violin-Piano Sonatas of William Bolcom. Greene recently recorded the Concord Sonata of Charles Ives, available for free high-resolution download on his homepage. 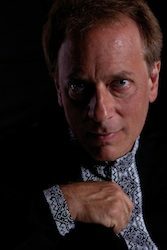 Greene has performed with the Philadelphia Orchestra, the San Francisco, Utah, and National Symphonies, the Czech National Symphony, the Tokyo Symphony, and many others. He has played recitals in Carnegie Hall, the Kennedy Center, Moscow Rachmaninov Hall, Tokyo Bunka Kaikan, Lisbon Sao Paulo Opera House, Hong Kong City Hall, and concert houses in Shanghai and Beijing. He toured Japan and Korea many times. He was an Artistic Ambassador to Serbia, Kosovo, and Bosnia for the United States Information Agency. Greene has been on the faculty at the University of Michigan School of Music, Theatre & Dance since 1990. He has won the Harold Haugh Award for Excellence in studio teaching. His current and former students include prizewinners in international competitions, and his former students hold important teaching posts throughout the United States. He is a frequent judge at international competitions, including the Gilels Competition in Odessa and the Isangyun Competition in Tongyeong, South Korea.